Noboru Hanyu, on January 26, 2011, established a $500,000.00 endowed professorial chair at the Institute of Buddhist Studies to honor his late wife Yaeko, who passed away on November 1, 2002. 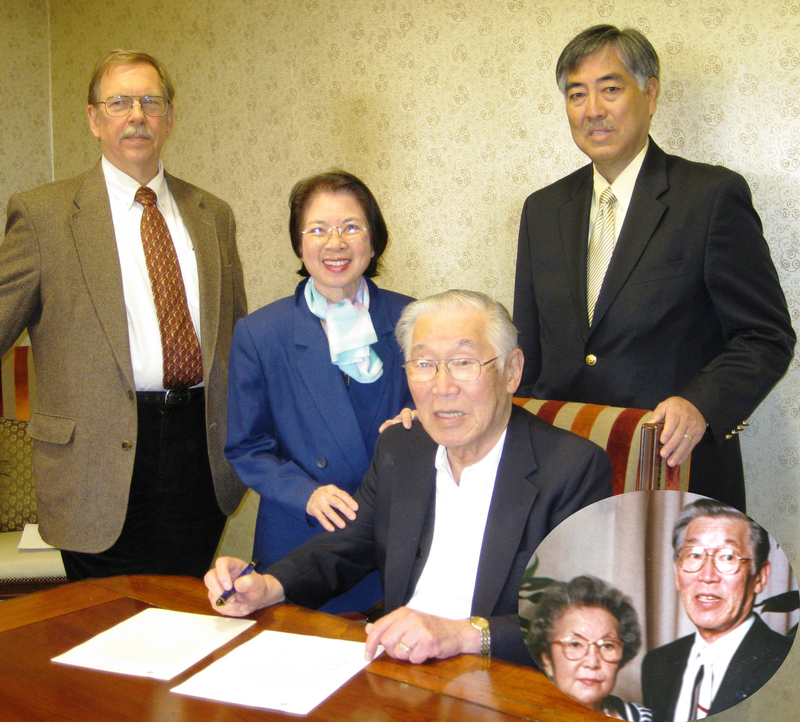 He attributes his life long association with the Buddhist Churches of America to the support of his loving wife. “This chair is my way of expressing my appreciation to Yae for her support and will keep alive her spirit of dana for the Buddhist movement in America,” Hanyu said. The IBS is a graduate seminary of Buddhist ministry, and Buddhist studies. The chair will be named the Noboru and Yaeko Hanyu Buddhist Chaplaincy Professorial Chair and will be gifted through Mr. Hanyuâ€™s Living Trust. The IBS Endowment is part of the BCA 21st Century Campaign; therefore, the BCA Endowment Foundation will administer the assets of the fund. The IBS Deanâ€™s office in consultation with the faculty and Board of Trustees will determine the use of the funds. Hanyu, a long time member of the Buddhist Church of San Francisco, while being active at the temple has been taking many leadership roles in the Buddhist Churches of America. In 2009, he was awarded BCA Lifetime Service Award for his dedication to BCA for over 60 years. His various positions with the BCA include President of the BCSF, President of the, BCA, Chair of the Sustaining Membership Program, Chair of the BCA Ministerâ€™s Pension Program, BCA Headquarters Administrative Officer, Treasurer of the Campaign for Buddhism in America, and Treasurer of the BCA Endowment Foundation from 1965 to 2008. “On behalf of the IBS, I would like to express our heartfelt gratitude to Mr. Hanyu for his generous gift. Buddhist chaplaincy is a new development, one that allows the propagation of the Buddhist teaching in hospitals, and hospices, jails and prisons, in military and university settings. Chaplains are trained to serve anyone and everyone in need, no matter what the personâ€™s religious affiliation. The purpose is to serve that individual, to make real the spirit of compassion that is the heart of the Buddhaâ€™s message. “This is an important area of future growth for Buddhists in the United States today, and the support of the Noboru and Yaeko Hanyu Endowment will make it possible for IBS to train a new generation of Buddhist leaders, manifesting compassion in the most difficult of life situations, those of disease and death, punishment and servitude, loneliness and isolation,” stated Dr. Richard Payne, IBS Dean.